All Hands to the Books! Where does one begin? Well, it begins with some great reading and research. As a former culinary professional, I ravaged, plundered and spirited away many culinary tomes from the used book shops and thrifts. For there are lots of prize old cook books, local, international, home diaries or traveler journals to help you on the way. These are the best resources to start with. 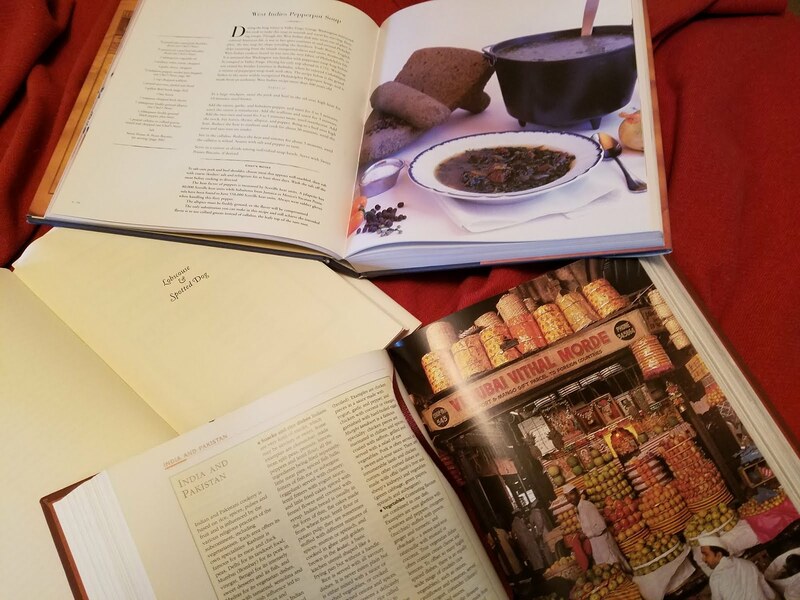 A few of my favorites are Lobscouse & Spotted Dog by Grossman and Thomas, the City Tavern Cookbook by Staib, LaRousse Gastronomique by Potter; my primer in culinary school; and countless others await us. When it comes to the internet, I recommend it to chase archives down and other research done on the topic. Your curiosity is shared by many others, new friends await. I will caution you, not all sites are given the equal attention to the details as others, but when all else fails. Return to the books. They are normally well researched, recipes are tested and typically have a good following. Success is nearly guaranteed. The French call it mise en place, professional cooks call it the Mee-z, simply put square your stuff away right and proper. Basically, get organized and figure out what you need to make that dish. Finding the book is one thing, finding the ingredients is another? What was once common on the table is pretty uncommon in many ways, yet in others. They have transformed into more widely accepted flavors, textures and qualities to the modern taste palette. For example Catsup, once a far eastern sauce from China was a fermentation of fish and aromatics. A close cousin was the Roman Agar; what we call Worcestershire sauce today and Vietnamese Fish Sauce is even a bit closer. This was brought to Europe by the traders and transformed in to mushroom catsup, fruit catsups and finally in the 1876 Heinz found the right mix with Tomato Ketchup and now we use it a lot, like millions of pounds of it. There is much more to just this one topic, catsup. You could spend months of time chasing it. But that is the fun and excitement of it. Discovering the past, tasting it too… if you are prepared. In short the trade routes, both land and sea. Brought new ingredients, methods of preservation and flavors to Europe and this case England. Over time, they became staple then a bit further refinement takes place into dishes that we stoically refer to as English. Shopping for the ingredients can be both frustrating and rewarding. Commercial chains grocery stores have many of the base and staple ingredients you need, cuts of meat, butter, cream and such. Sometimes you have to go askew and wander the wilderness of Asian Markets, Farmers Markets, Latin American Grocery stores and other strange but rewarding places. There you will find all kinds of teas, salts, herbs, fish and spices that cannot be sourced elsewhere. The internet, yet again has its place. For instance, good cooking suet is still made in England by Argo. Great stuff… and a necessary for a good Spotted Dog or Figgie Pudding. But be cautious and look to see if the vendor has a good reputation and is not priced to highly. It takes time, sometimes… piles of it. Plan your work time way ahead. Give extra time on new dishes, due to the many unknown’s you might be facing. As with many skills, the more you do it. The easier it become and less stressful. Once is not perfection, but it is one less time till you get to the perfect one. Lastly, when it comes to ingredients, I cannot stress this enough. Hit the Farmers Market in your area. There is a lot of knowledge, from cuts of meat, to cheese making, to produce. If they don’t have it, they might know a friend of a friend. Plus they are super eager to share their knowledge and if you are lucky. You can go hang with them as they go through the process of making that ingredient or harvesting that produce. My wife sometimes cringes when she goes to the basement and is affronted with a new strange aroma; by the way honey... That is sauerkraut from a recipe I found on a food blog from Pozen... It just has to ferment another two months. ...to be concluded tomorrow in part 3, "Dishing it out"